Two days of Zero firewood use! 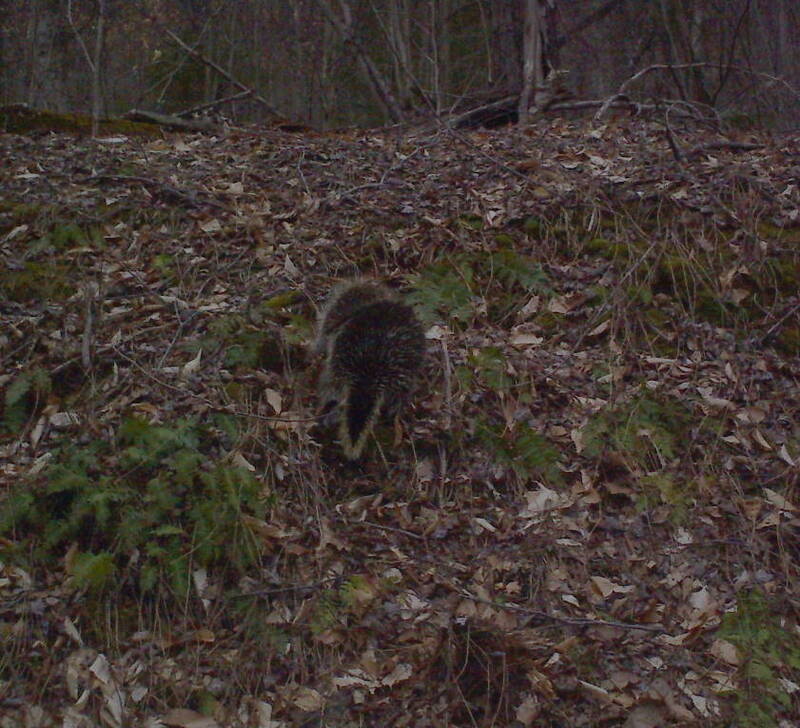 Well, it is officially mating season for porcupines or as I like to call them "Quill Pigs." They are out in full force trying to find each other and make more prickly little creatures. Coming home the other night from the edge of the State Forest to the house, I saw eight of them; five in the last two miles near the house. That is one less than every quarter mile. I think that is a record for me. They are out a lot in the evening and night time, but I have seen them during the day as well. Since they have caused me thousands of dollars of damage to my equipment, vehicles and dogs, we are on high alert. I saw the one in the picture on the way up from Cedar Run he scurried away from the camera unwilling to have his face on film. This one is about average size for the ones I have seen. I have seen them larger up to forty pounds and smaller than this one who I put at about twenty pounds. The turkeys and grouse have been out doing the mating dance as well. I have seen many running after each other across the road. The grouse are not the brightest birds when it comes to cars. One of their defenses is to freeze and not moving on the road can be deadly. So remember if you see one on the road it may not move until it is too late. I also saw my first bear, a second year cub, just above me along the road. Although the bears have been out for a while, I just hadn't been in the right place at the right time to see one. Soon they will be checking all the picnic baskets for a free meal as tourists and camp owners come in they know to watch out for any easy pickings. The weather has been erratic we had several days without using firewood and are now back to warming the cabin up after cold nights in the 20's and cool days in the 50's. We have been getting some nice sunny days and that always makes it feel warmer on the South slopes if you stay out of the wind. I can report no snow on the ground sightings anymore, however a few flakes drift down now and then to remind us it ain't summer yet. 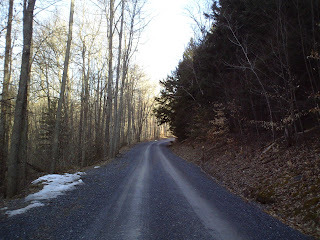 I have been working long hours at a new job in Wellsboro as well as doing my carpentry job, so I haven't had as much time to enjoy the mountain as usual this last month. It is the old thing of no money lots of time, no time more money. Too bad we have to choose. Roads are all open and ruddy, so come and enjoy the mountains. Mountain girl, Paula, logging out. There is always something exciting about the first 24 hours of no firewood use to keep us warm. Yesterday, I awoke to a temperature of 68 degrees inside the house, a full ten degrees above normal for morning. I had to stop myself from an almost automatic march to the wood burner to start a fire. It got to 67 outside yesterday, which kept the wood use to zero. This morning was a repeat of the same, although the weather predictors are saying the temperatures will drop this afternoon and threaten my streak of firewood savings. I sat in the sun on a chair in the front yard for a while before going to work and listened to the happy birds and enjoyed the feeling of a warm Spring morning. When I drove into Wellsboro, everyone was outside walking with smiles on their faces. Winter weather makes one appreciate a nice day when we get it. Although, I am sure it won't be long before people are complaining about how hot it is...seems we love to find something to complain about. 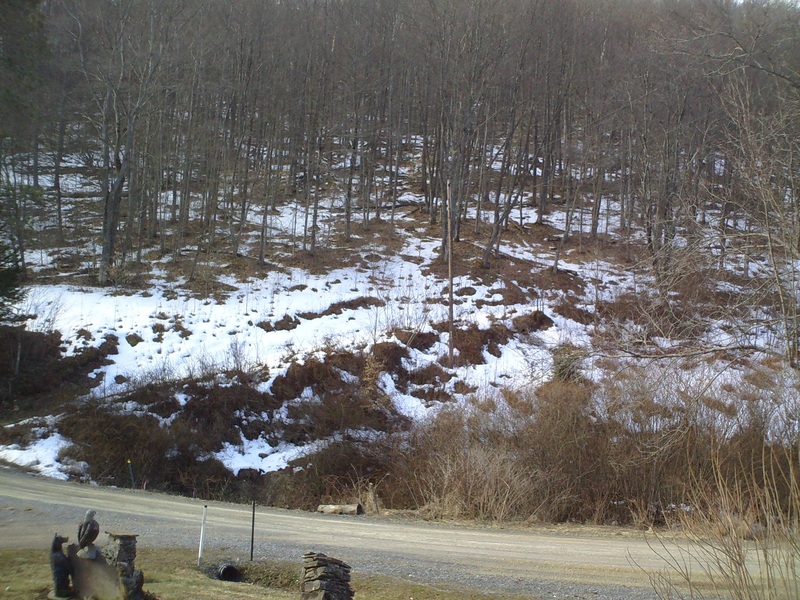 But for now I am watching the snow disappear from the north side of the mountain and enjoying a pleasant day in Leetonia. Mountain, girl, Paula, logging out. 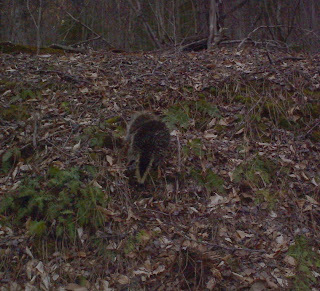 Loren Nowak of Round Top Road, Wellsboro, says these pictures were taken early Friday morning, March 29, by a Moultrie trail camera. “My guess is that this cat is a yearling mountain lion,” he said. “What do you think?” The camera was set up to catch raccoons and skunks who might steal his chicken eggs. Seems there is a big cat near Wellsboro. So much for rumors when you have a real picture. This makes my feral cat look very small. They had a wildfire on Reese Hill road today outside of Wellsboro too. Things are getting dry and windy so watch your cigarettes and trash fires carefully. It got above 60 today for the first time this Spring. Even with these temperatures the snow on the North Side of the mountain is resisting leaving. However, the weather change allowed me to get out and clean-up from the mess left by snow and firewood. We even got the porch swing moved back to the front porch and sat out listening to the birds and watching the Robins on the front yard. Before the bugs come it is very pleasant to sit on the porch in this nice weather. The other good news is the cat has returned after being run off by raccoons invading the garage. We have gone to putting food out for the cat only during the day and taking it up at night. The raccoon still got into the garage hoping for a left-over, when Lee Anne saw it she promptly went out with a stick to do something to it. I suggested that might not be a good strategy against a mad cornered raccoon. She got lucky or maybe the raccoon did as it hid somewhere not showing itself. 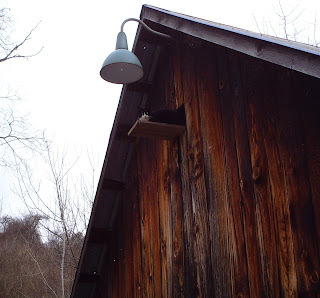 With the weather warmer and the cat hanging around, I will have to trap it so we can get it some shots and it doesn't get rabies or distemper from any of the wild animals. As it is now if it would scratch us we would have to go through shots and that would not be a very fun thing to do. Our local shelter has a way to sedate feral cats inside the trap then neuter and vaccinate them, which is a great way to get a more than difficult problem solved. This morning the weather started at 20 for my morning walk to the top of Cedar Mountain. The sun rose quickly into a clear blue sky and shone brightly by the time I got up to Wilson Point Road. By the time I got back to the house it was 39 and made it all the way to 50 for the high of the day. 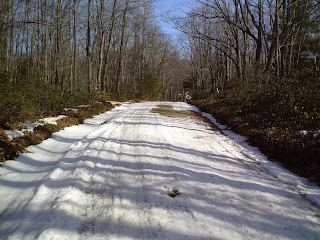 The roads vary from dry and dusty to a small amount of snow and you shouldn't have much trouble driving through any of the State Forest roads with caution. I would imagine with the warm temperatures most of the snow will be gone by the end of the weekend. On a sadder note our feral cat has gone missing the last three days. We had an invasion of raccoons, who got into the cat food in the garage opening the metal container I kept the food in, crushing the food bowl, and leaving teeth marks in the metal can of cat food. We heard them making noise and when we got up didn't see the cat. I haven't found the cat dead anywhere, but if they chased him off in the middle of the night he may not have met with a good end as Lee saw a bobcat outside the kitchen window the other day. We also have owls, coyotes, and fox who would gladly make the cat a midnight snack. It is sad to see the cat porch empty each day and now with three days gone by and no cat it isn't looking too hopeful for his return. Life is rough in the mountains of Leetonia and the cat was lucky to have found free handouts for the winter. I will update you all if he returns. We are looking forward to real Spring and weather above freezing and hopefully some numbers in the 50 and 60's. If you are coming for the weekend it should be nice until Sunday when rain is forecast. Mountain girl, Paula, logging out.